Need we say more? The name really says it all. Its appearance speaks volumes, yet masks a stunning complexity. There’s more to the skull than meets the eye! 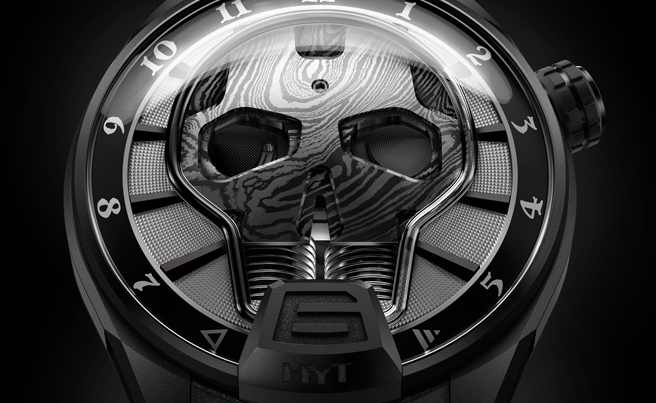 One would naturally assume that the starting point for the Skull Bad Boy was the skull itself, unveiled by HYT in 2015. Not so. The creative impetus actually came from the new liquid which surrounds it. This is not a simple aesthetic variation. This opaque black, so simple to look at, took more than 12 months to develop. Like the four other colours developed by HYT, the black version has its own chemical properties. These affect attributes such as viscosity, expansion coefficient and UV resistance. Its creation meant going back to scratch. The goal? to create a fluid able to adapt to the constraints of an HYT movement, which does not adhere to the wall of the capillary, can hold a meniscus and does not interact on a molecular level with the elements it comes into contact with. The result was achieved in autumn 2015 before undergoing several weeks of testing to confirm its chemical stability. Chemistry was one concern, but aesthetics was another. Creating a black fluid is not without its problems: whilst the other colours created by HYT are able to reflect all or some of the light they receive, black absorbs everything. The inevitable result is that it is impossible to read the time on the Skull Bad Boy in the dark. “It was a deliberate decision“, explains Vincent Perriard, CEO of HYT. “There were other solutions which would have made the piece visible at night. But if we wanted to play with the darkness inherent to the Skull Bad Boy, we had to go all the way. Night is part of the world of shadows and darkness. Perfectly in tune with the spirit of the skull“. To go with this new black liquid, HYT wanted to create a skull with the distinctive appearance of Damascus steel, used for knives and Samurai swords. The dial comprises two half-moons decorated with the Clous de Paris stud pattern. Its indexes are created in a Gothic font, complementing the Skull Bad Boy’s hard rock look. Its matte black 51 mm case, made from fully microblasted DLC titanium, is attached to a brand new buffed alligator strap with hints of slate grey. It has a velcro clasp so that it can be adjusted to fit on a leather biker jacket“, says Vincent Perriard with a smile. The Skull is coated with a new composite material, created to resemble Damascus steel. A foundry in the Neuchâtel region created the raw material: multiple layers of steel and carbon are folded in on themselves a total of 256 times! This material is cast in batches of five skulls, no two of which will ever be identical. All the functionalities of the original Skull have been preserved. The power reserve indicator sits in the right eye socket, which gets darker as the piece reaches the end of its 65-hour power reserve. The left eye socket houses the seconds disc, permanently, imperceptibly, turning.